How can I get a rate quote? What if I want to schedule daily pickups? How late can I schedule a pickup? What documentation is required to ship? How do I get set up with shipping software and supplies? How often do you bill and what are your payment terms? How do I file a claim for a lost or damaged shipment? To open an account with us print out the credit application form, complete and fax it to 770-991-6928. We deliver to every zip code in Georgia plus certain cities in AL, FL, SC, TN. Contact sales for more information about cities outside of Georgia. Use this form or contact sales. After your account has been setup call customer service at 800.822.1084 or email them. There are no requirements for daily pickup. If your weekly invoice totals meets or exceeds a minimum amount then your pickup is free. If it is less, then a fee applies. A pickup time can be scheduled to fit your shipping and receiving needs. MGC will accept single pieces up to 70lbs. Any one dimension of yours shipment needs to be less than 72”, and the length and girth combined cannot exceed 130”. Times vary by location and a range of times can be setup to fit your business needs. Please contact customer service for more information. 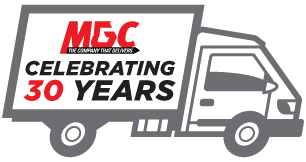 We require the use of an MGC waybill or a label generated using our online shipping system. Please contact sales for more information. Please call 800.822.1084 for billing assistance. Invoices are generated weekly. Payment is due upon receipt.